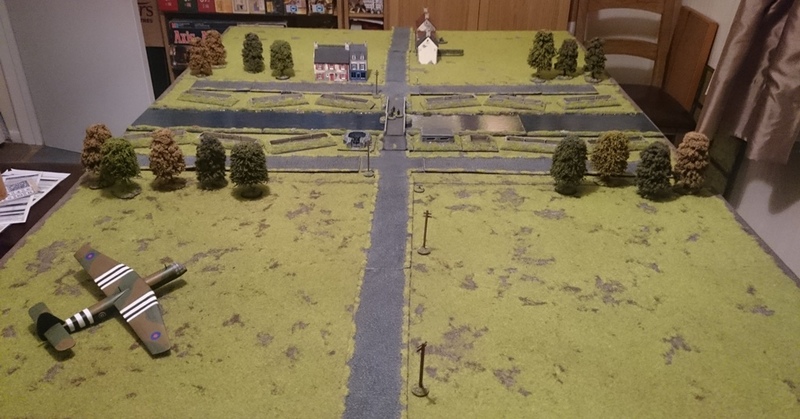 After months of building, painting, and playing a few test games, we were finally ready to kick-off our ‘Winged Horse’ campaign – the British 6th Airborne battle on and immediately after D-Day 6th June 1944. Appropriately, the first scenario is ‘Operation Deadstick’; the assault on the Orne Canal Bridge. The British force for the assault comprised of 2 Squads of 10 Paratroopers, 1 5-man Engineers section and 3 Senior Leaders: Major Howard, Lt. Brotheridge and Sgt. Tappenden. All troops are Elite. The German defenders comprised of a squad of 10 Sentries (classed as Green) led by a Sergeant, a Regular Infantry Squad, a Pak 38 with crew, a tripod mounted MG-42, plus a couple of support options which may or may not appear during the game. Since this was a mix of Green and Regular troops, when deciding the Force Morale, we applied a -1 modifier to the Dice Roll. The Germans had a Force Morale of 8. This was the scenario map. …and how it looked on the table. The German Sentries remained on the bridge, oblivious to their approaching nemesis. The Brits continued to push forward, with Major Howard urging the Engineers forward. …but under cover of darkness, the sentries had no idea that the Paras were almost upon them. Whilst trying to work out how best the spotting rules worked, we quickly dispensed with the proposed rules for sound. Instead, we came up with a simple system of rolling 3D6, and the result was the number of inches that the sentries could see. This was rolled at the start of the phase, and if the sentries could see the Paras, the alarm was raised. They are rather surprised to be confronted by the Brits, and open fire, causing a bit of consternation amongst the British, but little else. The Paras return fire with deadly affect. The driver is killed (-1 Force Morale), and as he slumps over the wheel, the car leaps forward, narrowly missing Lt. Brotheridge (who leaps out of the way) and crashes into the side of the bridge. The sentries continue to fire at the Engineers on the bridge, but their fire proves ineffective. The Engineers then find and disarm the demolition charges, effectively ending the chances of German victory. And the battle culminated in a firefight between the Paras in the trenches and the squad in the Cafe. However, the British managed to bring an overwhelming amount of firepower to bear (Dave was rolling consecutive phases again) and the remain squad was quickly dispatched. It was during this firefight that the British suffered their only casualties of the game, with a single soldier being killed and one of the Corporals being wounded. The Germans lost their final three Force Morale points when the German Junior Leader was first wounded, then killed, and then the squad was routed. I was expecting this scenario to be an uphill struggle for the Germans, and so it proved – in the end the Paras lost a single man killed, plus a wounded Corporal, which accounted for their single loss of a Force Morale point). It wasn’t helped by the fact the Dave managed to roll four consecutive phases early in the game and got across the bridge before I could mount any form of defensive line. It also isolated my MG-42, (which was in the control bunker – I never managed to awaken the crew to get them across the river to man it) and made blowing up the bridge extremely difficult. The rules we played to reflect surprise seemed to work, but were pretty brutal – as the Germans, my hands were tied for most of the game due to lack of Command Dice. I’d just gained a full number when I started losing them again due to Force Morale. The appearance and subsequent death of Major Schmidt was the highlight of the game, although this did cause the biggest delay – The Paras hit the Kubelwagen, which caused it to leap forward at full speed (although this turned out to be 8″). Lt. Brotheridge was stood in the way, but we couldn’t find any rules for vehicles running into infantry (except for tank overruns) – eventually we decided that Brotheridge should take a test as if his squad had been hit, he survived, rolled out of the way, and then killed Major Schmidt for trying to run him down with his car – great stuff! A brilliant start! Great AAR and nice-looking game. Fantastic game! Really fun write up! Wondering if the safe landing of the Horsa was a foregone conclusion, or if the British player had to roll for where the glider touched down, if it was damaged, if any troops were injured. Is this sort of thing covered in “special rules” for the scenario?